If you logged into social media last week it would have been almost impossible not to notice the abundance of hoverboards, self-tying shoes and time travelling DeLoreans. Yes – 22nd October 2015 is the only date in history with the moniker ‘Back to the Future day’ – the day that Marty McFly travelled forwards in the second installment of the Back to the Future movie trilogy. How lucky we were to be alive to finally see this day, even though it was a monumental let-down after waiting for 30 years (yes – 30 YEARS) to experience a day that was, well, pretty much like any other. However, one new addition to my life was that I did get to play Back to the Future: The Game – 30th Anniversary Edition. Did this make up in the slightest for the lack of a food rehydrator in my life? The game is a point and click adventure from Telltale games, the developers who brought you adventures such as The Wolf Among us, The Walking Dead and more recently that of Tales from the Borderlands and the videogame adaptation of Game of Thrones. 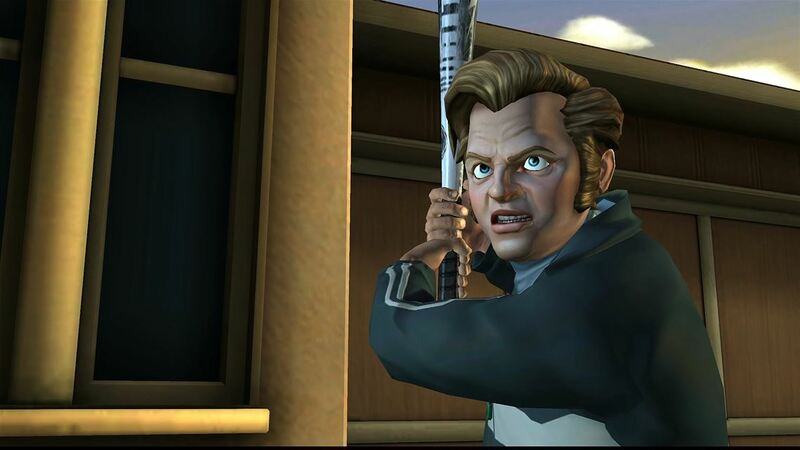 You play as the time-travelling, guitar wielding teenager Marty McFly. The story is set six months after the end of Back to the Future III and ‘Doc’ Emmett Brown has mysteriously disappeared. 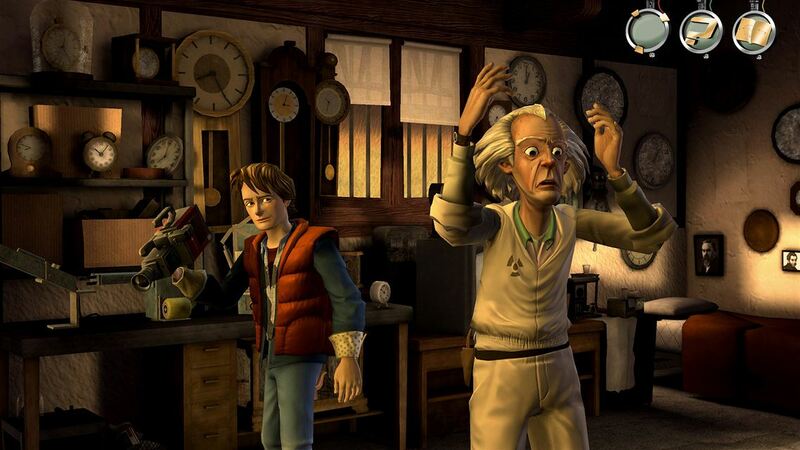 The appearance of a driverless DeLorean leads Marty and Doc’s faithful mutt Einstein on a journey back to 1931 with a mission to save the 1985 Doc from certain death; by befriending the teenage Doc and persuading him to abandon his fledgling career path of lawyer to one of mad scientist. This adventure, of course leads to all sorts of time-line kerfuffle which sees Marty and Doc moving backwards and forwards through time, from 1931 to an alternative 1985 and back to 1931 again in order to mend the rips in space-time that their meddling has caused. Each part of the story is set as a discrete episode with five altogether to work through. As a fan of the movies, being able to reimmerse myself into the Back to the Future universe was an enjoyable nostalgic trip back to the 80s. If you have never watched the movies then don’t let that put you off the game, a quick recap at the start of the first episode will bring you up to speed, although you might not get all of the in-jokes. Having already been to Hill Valley in 1955, 1985 and 2015 in the movies, being able to visit this time in 1931 was a treat. We also get to meet wimpy Arthur McFly, Marty’s Grandfather as well as Biff’s Father, Kid Tannen, the mobster who is running the town. The story was a good continuation of the saga, even though it was much more convoluted than a movie would be in order to provide as many gaming hours as possible. And what a lot of hours I got. Part of this may be due to the fact that I take way too long figuring things out, but some of this time was wasted due to the fact that you can’t skip dialogue. On the most part this was fine as I enjoyed listening to what the characters had to say but when you accidently click on something and have to listen to a repeat it gets frustrating. This does happen a little too much for my liking as the point part of the point and click mechanism does take a while to get used to; it can be difficult to know exactly what the icon is pointing to at times. Another frustration comes in the form of the inability to move the camera which means you often can’t tell which way to move so Marty often spends far too long walking around in circles. In other features of the game, you can use the left trigger, to see all the click locations and by using the left bumper you then choose each one in turn. This is useful when you have to act quickly and means that you rarely miss useful objects. There is also a hints section which offers just enough help when you are hopelessly stuck and the option of seeing Marty’s next goal or a recap of the story so far which is handy to bring you back up to speed after a break from the game. The animation is adequate – I wouldn’t say it is the best I’ve ever seen, there were a few bugs but it doesn’t distract from the gameplay. The voice acting was very good with the talents of Christopher Lloyd as Doc and Tom Wilson as Biff (who played the characters in the movies) amongst those included. Whilst Michael J Fox only makes a cameo appearance, AJ LoCascio stars as Marty and is almost intinguisable from the great man himself. This shows you how much effort went into making the game and if you’re not convinced then the game also contains a behind the scenes video about the development of the game featuring interviews with the cast and movie trilogy co-writer and producer Bob Gale. 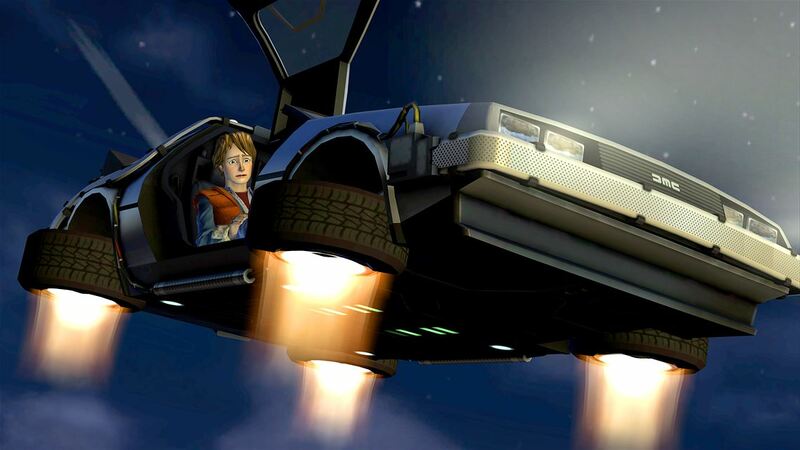 Back to the Future – The Game: 30th Anniversary Edition may be a mouthful but the game is a super-sized romp through space and time, one which will delight fans and even the few who haven’t seen the Back to the Future movies. Previous articleLet’s Play Overlord: Fellowship of Evil on Xbox One!